The head of Sudan’s ruling military council has resigned in a speech broadcast live on state television, naming Lieutenant General Abdel Fattah Burhan as his successor. The announcement by General Awad Ibn Auf came late on Friday as tens of thousands of protesters rallied in Sudan’s capital, Khartoum, demanding a civilian-led transition after the military overthrow of the country’s longtime ruler, Omar al-Bashir. “I, the head of the military council, announce I am giving up the post,” Ibn Auf said, just a day after he was sworn in as the head of a transitional military council. Ibn Auf said he was confident Burhan “will steer the ship to safe shores”, and added he was stepping aside to “preserve unity” of the armed forces. Protesters in Khartoum greeted the move with “ululations and cheers”, said Al Jazeera’s Hiba Morgan. Burhan, who was appointed as al-Bashir’s chief of staff and head of the ground forces in February, did not have the “same tainted record” as that of other al-Bashir era officials, she said, citing accusations of war crimes against both the former president and his successor during the 2003-2008 war in Sudan’s western region of Darfur. The new leader was one of the generals who reached out to protesters at the week-long encampment near the military headquarters, meeting with them face to face, and listening to their views. Morgan said Burhan was expected to address the Sudanese public on Saturday. “The protesters are waiting to see what kind of vision and plan Burhan has, [in order] to see if he is going to be the person they would want to represent them during the transition period, or whether they should continue with their sit-in,” she added. Protesters in Khartoum told Al Jazeera the toppling of al-Bashir and resignation of Ibn Auf within 36 hours was the result of “patience, sacrifices and struggle for four months”. 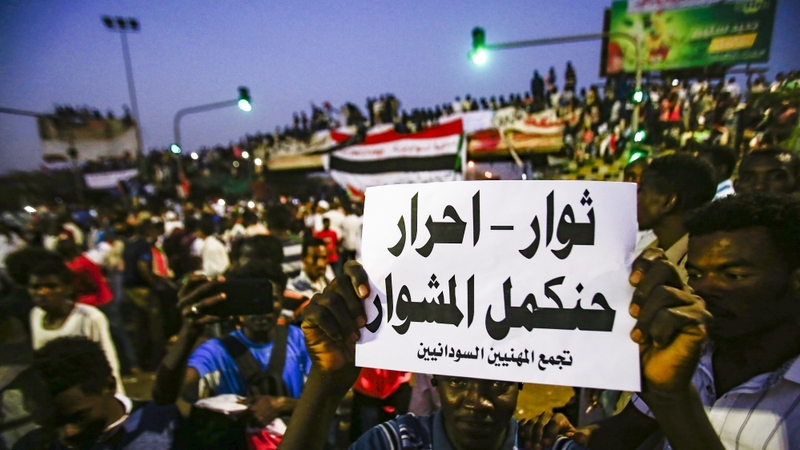 The Sudanese Professionals Association (SPA), which spearheaded the months-long demonstrations that triggered al-Bashir’s overthrow on Thursday, hailed Ibn Auf’s departure as a “triumph of the will of the masses”. 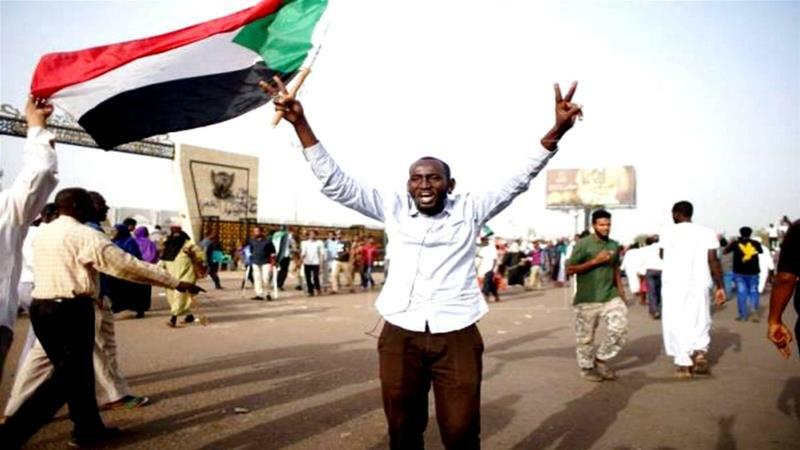 However, it called on residents of Khartoum to continue their days-long sit-in outside the army headquarters, in defiance of a nighttime curfew imposed by the army, until their demands for a civilian-led transitional government and democratic reforms, as outlined in the January Declaration of Freedom and Change, were met. They called for a “total strike until the full transfer of power” and urged supporters elsewhere in the country to take to the streets outside the military’s various posts “until these demands are fully implemented”. Ibn Auf’s resignation came hours after a spokesman for the military council promised to hold talks with all political groups in Sudan and declared it had no “ambitions to hold the reins of power”. The council was “ready to step down as early as a month if a government is formed”, said council member Omar Zain al-Abideen. Sudan’s military council also asked all “political forces” in the country to name two representatives by Saturday for a dialogue on the country’s transition, according to SUNA news agency, adding the time for the meeting would be set once it had received the names from all of the groups. Sudan’s envoy to the United Nations, Yasir Abdelsalam, reiterated that sentiment ahead of a Security Council meeting on Sudan. He said the military council would be the “guarantor of a civilian government” in which “no party” was excluded. The Security Council, which met behind closed doors, did not announce any action on Sudan, but the body’s president said all 15 members agreed to monitor events there closely. Meanwhile, Michele Bachelet, the United Nations’ High Commissioner for Human Rights, urged Sudanese authorities to “refrain from using force against peaceful protesters” and called for the release of all those detained for protesting. Earlier on Friday, al-Abideen said the military council wanted to “create an atmosphere to manage a peaceful dialogue”, but warned protesters that “chaos will not be tolerated”, however. According to activists, scores of pro-democracy protesters have been killed by Sudan’s widely-feared security services since the demonstrations began in December, sparked by anger over rising bread prices. The protests quickly evolved into broader calls for al-Bashir and and his political entourage to give up power.